FBI McCabe, Will Sessions Fire Him Stopping His Retirement? Wonder if Hillary is available for comment…. McCabe is a civil service employee who can’t be fired without evidence of wrongdoing. 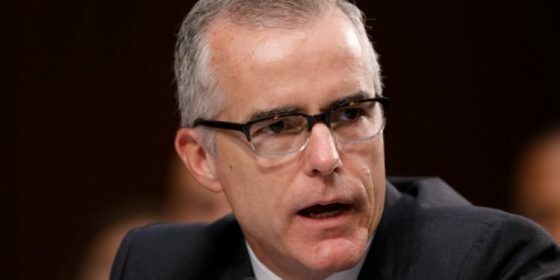 Several sources familiar with McCabe’s move told NBC News that he made his decision to retire as a result of a meeting with Wray in which the inspector general’s investigation was discussed. BI: Attorney General Jeff Sessions is reviewing a recommendation from the FBI’s Office of Professional Responsibility to fire former FBI deputy director Andrew McCabe, The New York Times reported Wednesday. McCabe was forced out of the FBI earlier this year amid an internal investigation by the Office of Inspector General into his approval of unauthorized disclosures to the media in October 2016 about the bureau’s Hillary Clinton email investigation. He’s scheduled to retire on Sunday, and a possible firing — which sources told The Times could could as soon as Friday — could endanger his pension benefits. The Department of Justice’s inspector general Michael Horowitz reportedly concluded in a report that McCabe was not forthcoming during the OIG review. The FBI office subsequently recommended that Sessions fire McCabe, according to The Times. The Wall Street Journal article at the center of the OIG’s inquiry was published on October 30, 2016, two days after then-FBI director James Comey announced in a letter to Congress that the bureau was reopening its investigation into Clinton’s use of a private email server to conduct government business when she was secretary of state. The article was a highly detailed account of internal strife within the top ranks of the DOJ about how to proceed after FBI agents investigating former New York congressman Anthony Weiner discovered 650,000 emails on his laptop that could have been sent to or from Clinton’s private email server. Many of the emails came from accounts belonging to Weiner’s wife, Huma Abedin, who was also Clinton’s longtime aide and a senior adviser to her campaign, The Journal reported. At the same time, DOJ anticorruption prosecutors were at odds with FBI officials over whether to continue pursuing a separate investigation into the Clinton Foundation’s financial dealings. While DOJ officials believed there wasn’t enough evidence to move forward with the probe and wouldn’t authorize further investigatory measures, FBI officials, including McCabe, believed they had the authority to continue the investigation using whatever leads they had already acquired, the report said. The reporter who authored the Journal’s article, Devlin Barrett, was in touch with two top FBI officials on the phone two days before the story broke, according to text messages released in February. The officials were FBI lawyer Lisa Page, who often worked with McCabe, and then-FBI spokesman Michael Kortan. The deputy director’s ouster came following a string of public attacks President Donald Trump leveled against him, accusing him of putting his thumb on the scale in favor of Clinton. McCabe’s wife, Dr. Jill McCabe, mounted an unsuccessful run for a Virginia state Senate seat in 2015. The Journal reported on October 24, 2016 that her campaign received $675,000 in donations from the Virginia Democratic Party and from Common Good VA, the super PAC run by Democratic Virginia Gov. Terry McAuliffe, a longtime Clinton supporter. None of the donations came from Clinton or her family. McCabe wasn’t in charge of the Clinton investigation at the time, and didn’t take on an “oversight role” in the probe until February 2016, long after his wife lost her election bid. and documents in January that confirmed McCabe was not warned against becoming involved in the Clinton investigation. But he recused himself anyway following The Journal’s report about his wife’s campaign. Most notably, the upcoming OIG report detailed by The Times stands in contrast to Trump’s assertion, given its focus on McCabe’s authorization of disclosures that ultimately resulted in a negative story about Clinton. Things are getting real and fast with Russia. Not only are we still ticked at them for meddling in our elections, which they’ve done for decades, they now are on the verge of going to war with most of the planet. 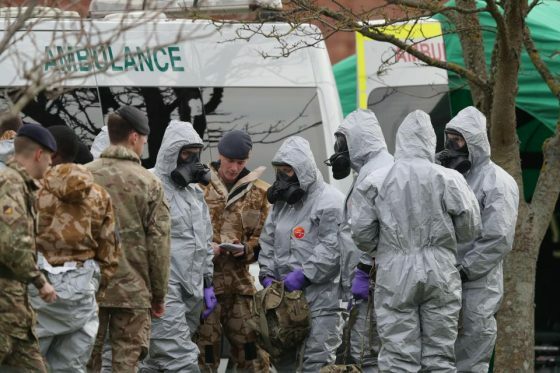 Last week, 21 people in Britain fell ill when a nerve agent was used on a double-agent and his daughter in Britain. People around them also fell ill and hundreds had to wash their clothes. Whole sections of the city are being cordoned off. A second attack killed another double-agent in Britain a few days ago. Russian exile Nikolai Glushkov was discovered dead with ‘strangulation marks’ on his neck on Monday night by daughter Natalia Glushkova in New Malden, South West London. There is no cure for the nerve agent used on the first victims and it is specific to the Russian government. It was designed to be as painful as possible and to gradually cripple its victims that don’t die immediately from coming into contact with it. 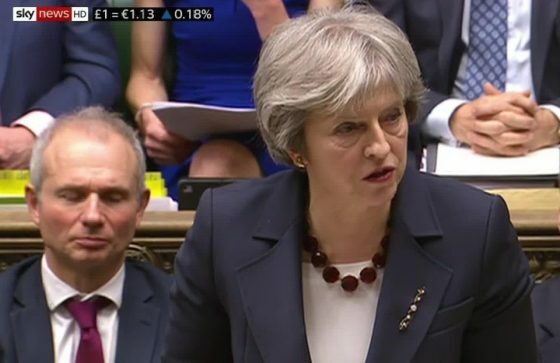 British Prime Minister Theresa May announced Wednesday the expulsion of 23 Russian diplomats (read spies) from the United Kingdom following the suspicious nerve agent attack on a former Russian spy and his daughter — the largest such expulsion since the Cold War. Not only that, Russia’s assets in the country have been frozen. President Trump is supporting Theresa May in this move. In fact, US Ambassador to the UN, Nikki Haley, had just warned Russia, Iran and Syria this week that we are on the verge of striking Syria again for using chemical weapons against their own people. When Putin heard all this, he literally smirked. Of course, they denied it and said that Britain would do well not to threaten a nuclear power. They are promising retaliation in kind and beyond, whatever that means. It is said that Britain is considering launching a cyber war against Russia over this and invoking Article 5 at the UN requiring all NATO nations to expel Russian diplomats and spies. That’s just the beginning. 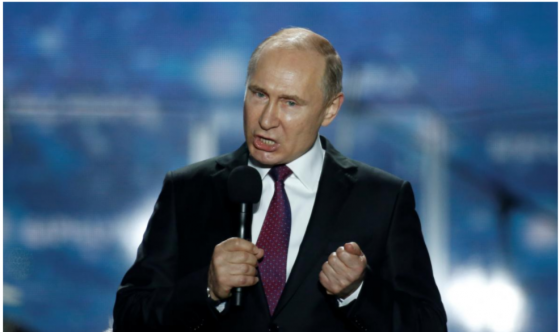 Russia feels emboldened after Obama’s weakness. They have allied with China, Iran and North Korea and war is very close now. It’s something I have warned on for years and now we are here facing off with the New Axis of Evil. The Cold War is about to go red hot. “The British government made a choice for confrontation with Russia,” the Russian foreign ministry said in a statement. May made the announcement hours after Moscow ignored a midnight deadline to explain how the military-grade nerve agent, which was developed by the former Soviet Union, came to be used against ex-spy Sergei Skirpal and his daughter, Yulia. They were found unconscious on a park bench. “All who have been identified as declared intelligence officers: they have just one week to leave,” May said. “This will be the single biggest expulsion for over 30 years and it will reflect the fact that this is not the first time the Russian state has acted against our country.” And there’s the rub… Russia has been causing trouble all over the planet for a long time. They are so arrogant they figure no one will retaliate. That will only play for so long. Additionally, May said no British officials or members of the Royal family will attend this summer’s World Cup in Russia. She also announced a range of economic and diplomatic measures, including a decision to cancel all high-level bilateral contacts with Russia. I believe the US will follow suit on this particular move and the tensions will ratchet up immensely. “[Russia’s response to the deadline] has shown complete disdain for the gravity of these events,” May said, adding the Kremlin has offered “no credible explanation” for how the Russian-made Novichok nerve agent was used in the attack. “This represents an unlawful use of force against the United Kingdom,” she said, noting Russian officials have treated the incident with “sarcasm, contempt and defiance. It must be met with a full and robust response,” May said. Frankly, May is showing far more backbone than I expected here. Good for her. An invitation for Russian Foreign Minister Sergey Lavrov to visit Britain has been canceled. The US should immediately kick out all Russian diplomats we have not already told to get out. All embassies should be shuttered and accounts frozen as well. May also said Britain would clamp down on murky Russian money and strengthen its powers to impose sanctions on abusers of human rights. “We will freeze Russian state assets wherever we have the evidence that they may be used to threaten the life or property of UK nationals or residents,” May said, without giving details. That’s not strong enough, but it’s a start. Britain’s media regulator Ofcom said Russian broadcaster RT could lose its UK license if Theresa May’s government determines that Moscow was behind the poisoning of a former Russian double agent in England this month. Since they are a propaganda outlet for Russia, they should lose their license and be kicked out of Britain. RT, or Russia Today, is a round-the-clock news network that is funded by Vladimir Putin’s government and runs eight TV channels including RT UK broadcast from London. Russia said there would be reprisals for any move to close the UK-based Russia Today news channel, a measure that May might ask the broadcasting regulator, Ofcom, to consider as one of her measures. “Not a single British media outlet will work in our country if they close Russia Today,” said Zakharova. So be it. May said that while many Russians who have made the United Kingdom their home and abide by the laws, “those who seek to do us harm, my message is simple; you are not welcome here.” The Russian ambassador in the UK warned to expect a retaliation for the expulsion of the country’s diplomats. Alexander Vladimirovich Yakovenko told Sky News the United Kingdom’s actions are “unacceptable” and Moscow considers them a “provocation.” “This is a really serious provocation,” he said. Look for Russia to expel British diplomats in retaliation and close their embassy there. Moscow has refused to comply with Britain’s demands unless the government provided samples of the poison collected by investigators. And even then they are saying it does not matter. They made fun of the Brits over it. Putin spokesman Dmitry Peskov told reporters Wednesday that Russia “rejects the language of ultimatums.” The arrogance is mind-blowing here. I’ve long warned about the Russians and many scoffed at it. Well, now they are beginning to see the Russkies sans their collective mask. Skripal and his daughter remain in critical condition in a hospital in Salisbury, southwestern England more than a week after they were found collapsed on a bench. Even if they come around, they will never fully recover. For them, the rest of their lives will be a living hell. That could be any of us. European Council President Donald Tusk said Wednesday the attack was “most likely” inspired by Moscow and announced he would put the issue on the agenda at an EU leaders’ summit next week. They’ll do nothing as usual, but it doesn’t matter. The wheels of war are now in motion. They can either begin to defend themselves or die in the coming confrontation. What Russia did in Britain was nothing less than an act of war. Theresa May told MPs that two dozen so-called diplomats who are in fact spies will be kicked out in a bid to stop Vladimir Putin meddling in Britain. She’s right… they are. The Russians are great at spying and stealing… it’s what they do. But just as in America, Britain has her own Russian apologists like Jeremy Corbyn who suggested that Russia might NOT be behind the attack and compared the investigation to claims about Saddam Hussein’s WMDs. The Brits have their own enemies from within. New laws to help Britain defend itself from all forms of hostile Russian activity. Flights and goods from Russia will face extra checks to stop ill-gotten gains entering the UK. All planned talks with Russian officials, including a visit from the foreign minister, are canceled. Assets belonging to Putin’s government will be frozen to stop them being used for wrongdoing. Suspected spies could be detained at Britain’s borders like terrorists under new powers. The UK’s allies France, Germany and the US are in full support of her tough stance. The alliance against the New Axis of Evil is forming with the US, the UK, France and Germany seemingly coming together. May warned Putin that Britain will not stand alone, revealing that Donald Trump, Emmanuel Macron and Angela Merkel have promised to present a united front against Russian atrocities. Overnight, leaders from Poland and Australia added their voices to the chorus of support for Britain, raising the chances of a coordinated global response to Russia’s atrocities. The board is being set for a world war and the lines are now being drawn. 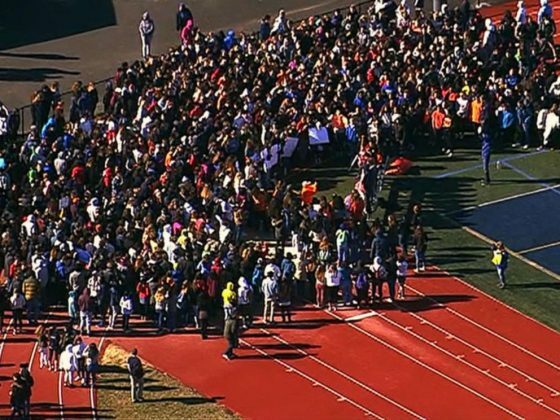 Today, thousands of students walked out of their classrooms across America to protest against gun violence. They usually did so with the full blessing and encouragement of their teachers. This sprang up after the mass murder in Parkland, Florida last month at a high school by a disgruntled former student who is also a deranged psychopath. 14 students and three staff members were killed in the shooting. 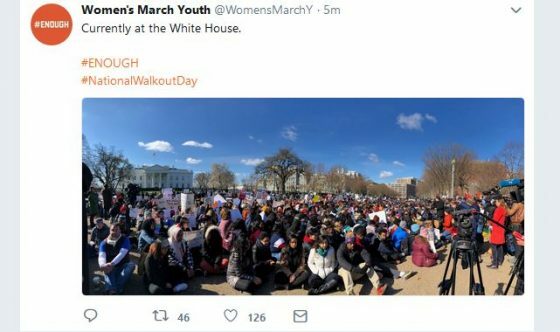 The National School Walkout was organized by the same people who organized the Women’s Marches. 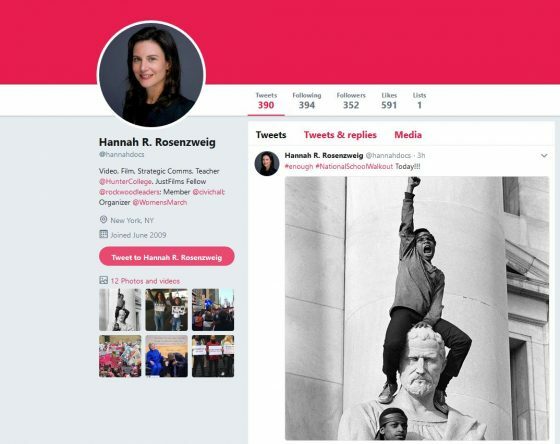 Marxists who are against the Constitution and the Second Amendment and think this is the time to take it down. Wealthy leftists including George Soros are funding the movement along with celebrities who have deep, anti-American pockets, such as Oprah Winfrey and George Clooney. 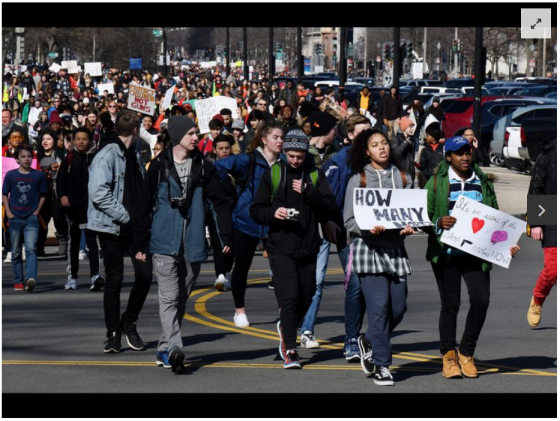 According to EMPOWER, the youth branch of the Women’s March, there are more than 3,130 school walkouts scheduled across the country, as NPR’s Adrienne St. Clair reports. “I’m just mad there’s no action by our government representatives,” Daniel Rogov, a junior in Brooklyn, New York, said today. Which is not true. Many would like to train and arm teachers at schools. They would also like to employ former police and veterans to guard schools. But stripping people of the right to bear arms, simply gives more control to the bad guys and encourages violence. “It’s all thoughts and prayers; it’s all talk,” he told ABC News. “After a gun violence tragedy there’s a speech talking about how we need change but there never is change.” These are the talking points of the radicals and Marxists who have coached and trained these kids into being useful idiots for their political agenda. 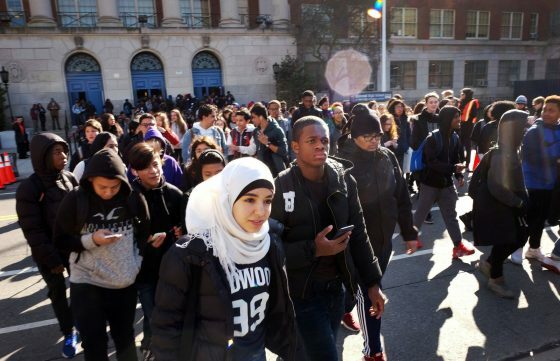 The walkout began at 10 a.m. in each time zone across the nation. It was scheduled to last 17 minutes. One minute for each of the victims gunned down in the Feb. 14 massacre at Marjory Stoneman Douglas High School in Parkland, Florida. Some schools are expelling kids who are walking out and I agree with them. This should not be allowed. To the students at Stoneman Douglas, Daniel’s message is, “Keep making your voices heard. While the politicians might stop talking about this, we’re not done.” No, they aren’t and those like Daniel and David Hogg are being used as walking, talking propagandists to abridge our rights and destroy them forever. 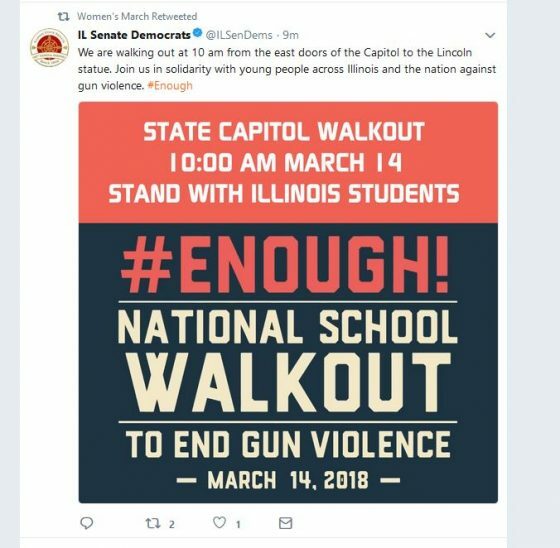 Over 3,000 walkout events were registered to take part in today’s call on Congress to pass tighter gun control laws, according to ENOUGH National School Walkout, the event organizers. They are taking place in virtually every state – the professional organizers did their job well. Some of the walkouts, especially in California, even turned violent today and this is just the beginning, not the end. “Remember why we are walking out,” Stoneman Douglas survivor Lauren Hogg wrote on Twitter today. “We are walking out for my friends that passed, all children that have been taken because of gun violence. We are walking out for the empty desks in my classes, and the unsaid goodbyes. This epidemic of School shootings must stop.” No, they are walking out to further a radical anti-gun agenda by Marxists and are too stupid to see it. 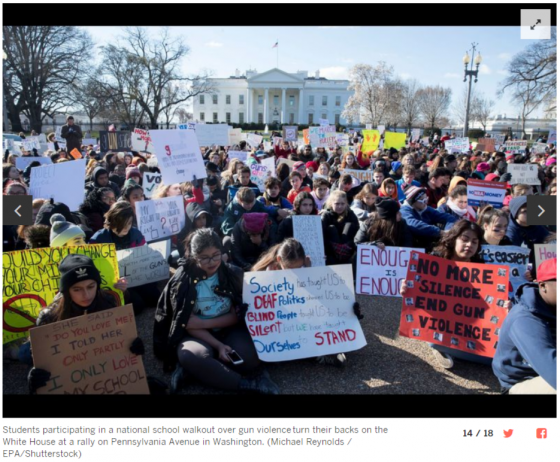 In Washington, DC, a huge crowd of chanting students gathered in front of the White House. 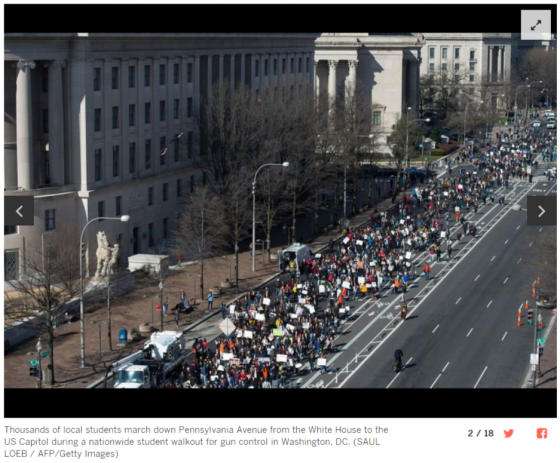 Once the clock struck 10 a.m., the students silently sat down with their backs to the White House. There were also ‘die-ins’ that took place in various locations. “We just want the White House to hear us,” Abby Silverman of Bethesda, Maryland, told ABC News outside the White House. 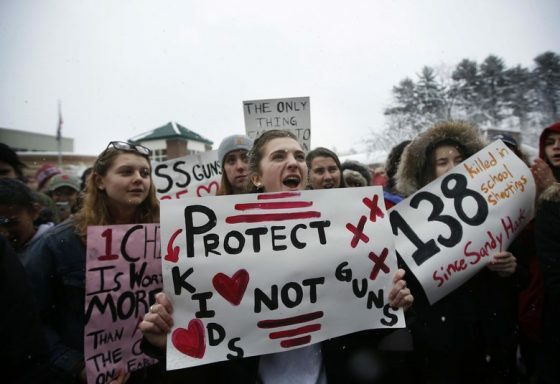 Leftists are making progress in taking away gun rights from those under 21, even though they serve in the military and these kids are helping them. Kevin Butler told ABC News he came to the White House to “make sure there are stricter gun laws,” and even though the President wasn’t there during the sit-in, Kevin thinks their voices will be heard. Yes, they will… and mainstream America rejects them. Outside Trump International Hotel in Manhattan, students chanted “Hey, hey, NRA, how many kids did you kill today?” None. They never have, but they do protect and lobby for Second Amendment rights. These kids are being taught that the NRA and anyone who owns a gun or supports gun rights is a murderer. It’s monstrous. Parents should speak with their kids about being used like this. In Times Square, students protested silently. Women’s March Youth Coordinator Tabitha St. Bernard Jacobs, one of the adults coordinating students in the movement, told ABC News before the event that while the walkout was sparked by the Florida school shooting, the event is about pressuring Congress to act against gun violence overall. They were just waiting for an emergency to trigger them. She said the walkout was a way to shed light on the kind of gun violence that exists not just in schools but every day, like shootings that affect communities of color or devastate cities like Chicago. You know… the city that is led by liberal Marxists and has the strictest gun laws in the nation… that Chicago. It’s so bad there that Navy medics train for combat because it’s as bad or worse than being on the front-lines in Afghanistan. While many school districts were supportive of the protests, some schools from Pennsylvania to Georgia had reportedly threatened to discipline students participating in walkouts, which I think is very appropriate. In Plainfield, Illinois, where some students had planned to walk out, doing so came with a guideline. 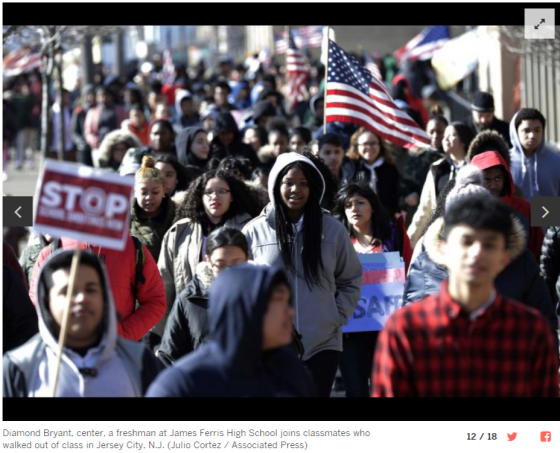 Students who wanted to participate in the walkout also had to attend an after-school discussion with state legislators to discuss issues that relate to school violence, like the political process, school safety, gun control and what influences politicians, Plainfield School District Superintendent Lane Abrell told ABC News. A student who walked out but did not attend the discussion with state legislators would get a one-hour detention, Abrell said. At least it’s a start. Abrell said the walkout “in my opinion … doesn’t really solve the issue,” and the meeting with local legislators is a way for students who are genuinely passionate about the cause to learn how school violence issues can be solved. 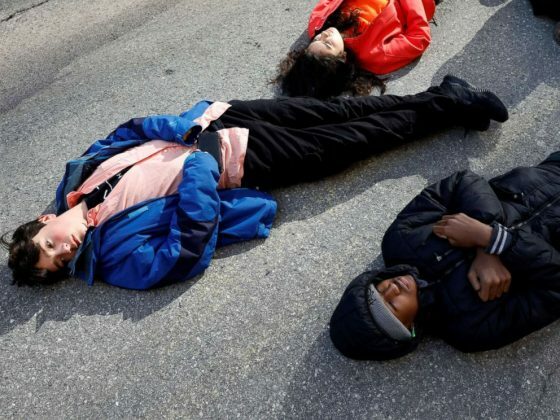 The American Civil Liberties Union (ACLU) said schools could punish students for missing class for walkouts, but the punishment should only be because students missed school and not as a harsher punishment because the students participated in a protest. Dozens of colleges and universities have said they won’t penalize applicants who are peaceful student protesters. This wasn’t just high schoolers and college students. Many elementary students took part in the walkout as well. The walkouts on Wednesday are among several protests planned for coming weeks. The March for Our Lives rally for school safety is expected to draw hundreds of thousands to the nation’s capital on March 24, its organizers said. And another round of school walkouts is planned for April 20, the 19th anniversary of the Columbine High School shooting in Colorado. Not all students support this and many are walking out under peer pressure. Parents should find out how their children are reacting to this so they don’t become radicalized.